We love a good appetizer and this fancy looking Herbed Cheese and Mushroom Bruschetta fits the bill of being delicious without being pretentious. Let’s face it–good food is good food, and when the perfect combination of ingredients comes together, there is no denying it center stage. Bruschetta is one of those recipes that can be prepared in so, so many ways. We’ve made our share of bruschetta recipes like this Brie and Raspberry Jam Bruschetta, and other appetizer recipes that we just can get enough of (like our fabulous Shrimp Dip), so making a bruschetta with mushrooms and herbed cheese made complete sense. 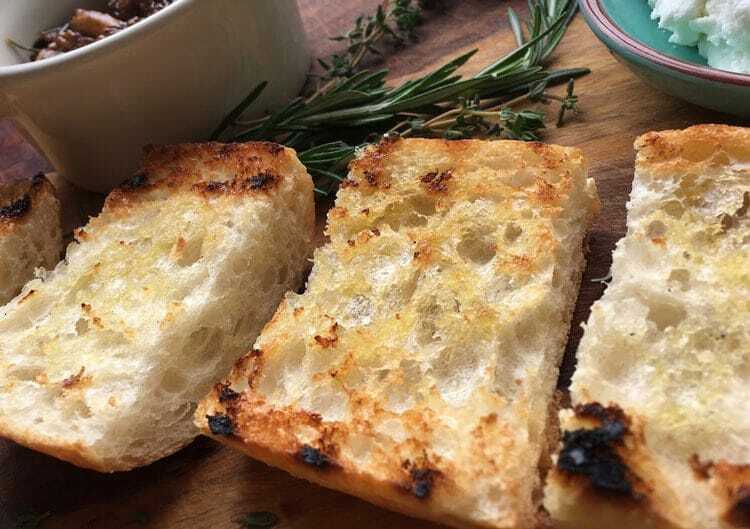 What makes this bruschetta recipe so great is that it is an appetizer for perfect for small, intimate gatherings. The presentation looks elegant but approachable, and the final result is truly delicious. 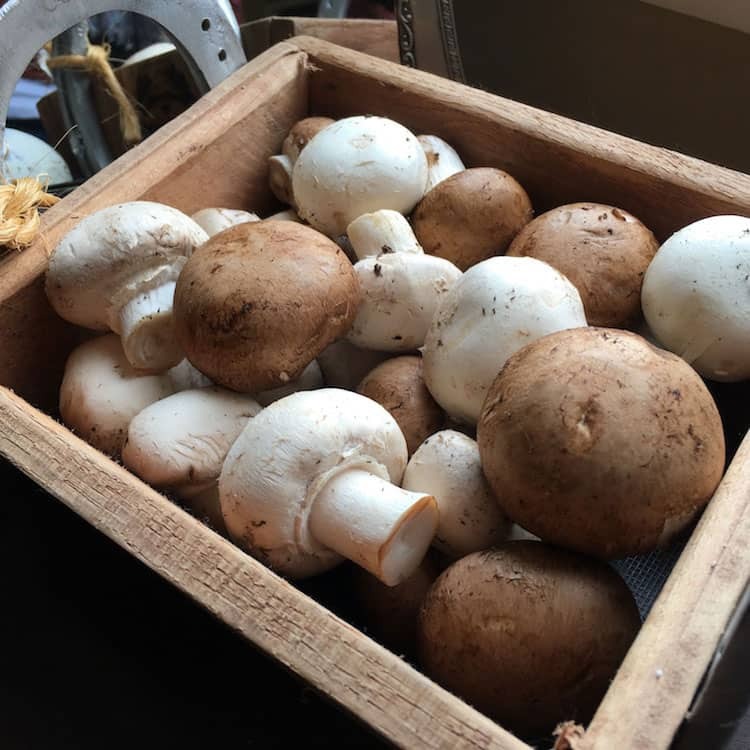 You can use any mushroom you wish, but we like the combination of small white, and baby Portobellos used here because they create an interesting mix of subtle flavors and textures. In a small skillet over medium heat, melt 1 tablespoon butter. Add oil and shallots and sauté 2 minutes. Add garlic and sauté 2 more minutes. Add mushrooms and sauté approximately 8-10 minutes or until mushrooms release juices. Add thyme and rosemary and sauté 2 additional minutes. Stir in brandy or peach juice and simmer until reduced by half. Turn off heat and whisk in 2 tablespoons butter. If desired, season to taste with salt and pepper. 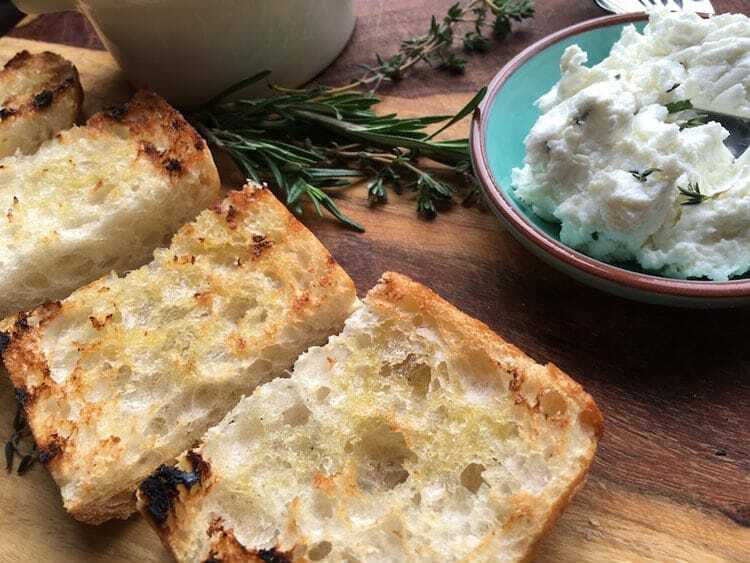 In a separate bowl, mix goat cheese with ricotta cheese and fresh herbs until well combined. Butter bread slices with remaining 2 tablespoons butter and place on grill over direct medium heat (or use a grill pan if indoors). Toast until golden brown. Then, spread with herbed goat cheese mixture and top with mushrooms. Serve immediately.